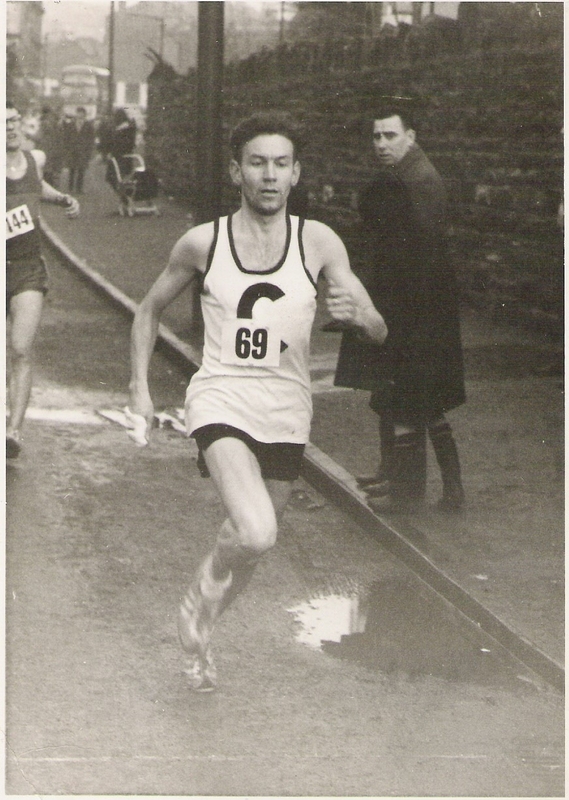 (Ian Leggett, pictured above in a 1960s Nigel Barge road race, is one of our most durable SVHC runners. He made his debut for Clydesdale Harriers in 1963 as a senior and quickly became a first team runner. Clydesdale won team gold medals in Dunbartonshire Cross-Country relay championships. Between 1966 and 1969, Ian emigrated to Australia but returned to run Stage Six of the Edinburgh to Glasgow in the latter year. From then up to 1973 he was at his fastest, running particularly well in the Midland (West) District CC (4th) and the National (31st). In the 1969 Scottish Inter-Counties CC he had perhaps his best-ever race, finishing second to international athlete John Linaker. In addition he ran well on the track, won long road races and tackled severe challenges like the Mamore Hill Race and Ben Nevis. Of course he was awarded several Clydesdale Harriers championships, for example the 3 and 6 miles track events, and other club trophies. Ian Leggett raced a great deal more than nearly all athletes nowadays. As a Veteran/Masters runner, Ian won Scottish middle distance track titles and ran for Scottish Veterans in the annual British and Irish CC International, winning team medals. His long fight to win a Scottish Masters CC title seemed to be making progress in 1986 when he was second M45 behind the aforementioned John Linaker. It was the same one-two (M50 this time) in 1990. Ian picked up two more silver medals (M60); and a silver and bronze in M65. At last, in 2011, Ian Leggett won a very well deserved gold medal in the M70 category, and followed that with, guess what, a silver the following year. I don’t usually reply to questionnaires as they usually result in cold calls about PPI or more questionnaires but in this case I felt I was safe enough. My Name is Ian Leggett, appropriately enough for a runner born and raised in Maryhill, Glasgow, where my allegiance to the famous Partick Thistle (JAGS) was formed. Married to Cathy for 52 years and blessed with 7 sons and 3 daughters (before we purchased a television set). CLUBS currently Lothian Running club, prior clubs Livingston, Clydesdale, Whyalla Harriers South Australia. OCCUPATIONS Ex Postman and admin worker. HOW DID I GET INVOLVED IN THE SPORT? During National Service played football and was drafted into athletic involvement – anything to dodge drilling and cookhouse duties. HAS ANY INDIVIDUAL OR GROUP INFLUENCED YOU? My first connection with athletics came as a result of following the Jags around the Glasgow Sports at Ibrox. In those days 5 a side football tournaments were highly contested summer events, but the highlight of that day was an Aberdeen runner by the name of Alastair Wood in the 3 mile race – left the other runners in the field for dead and made a lasting impression on me. He went on to win marathons but probably his finest achievement came in winning the famous London to Brighton race in 1972 and breaking the record. Another was Brian McAusland and the Clydesdale Harriers team of the 70s. We had great team camaraderie and absolutely fantastic changing facilities down in the basement of Clydebank Baths, with heated pipes and showers, where many a Bothy ballad rung out on a cold winter night after a training session. WHAT HAVE YOU GOT OUT OF THE SPORT? Lots of friends, healthy wellbeing and, through Masters events, travelling to many places around the world I would probably have missed i.e. Finland, Denmark, France, Italy, Slovenia, Australia – and even England. WHAT DO YOU CONSIDER YOUR BEST EVER PERFORMANCE? The last race I ran. YOUR WORST? Undoubtedly, as a novice runner, running the second leg of the Edinburgh to Glasgow relay. I was completely unprepared for this type of contest. The second leg usually featured the cream of the best runners and I ended up shell-shocked at the end of the leg and almost called it a day there and then. WHAT UNFULLFILLED AMBITION S DO YOU HAVE? To run overseas in a Scotland vest, instead of having to run as Team GB. OTHER LEISURE ACTIVITIES? My 13 grand children help me fill up my time outside the sport. TRAINING DETAILS? No secret! Arthur Lydiard processed the ultimate training schedules. It’s just adjusting your lifestyle to suit whatever your personal ambitions are. Group therapy suited me best, with the old version of pack runs, adjusting to the season of either track, country or roads – we were all very versatile in those days. There weren’t as many races on the calendar as there are today. When there was a free weekend without a race, there was a culture of going visiting other clubs to have a run and buffet afterwards. I remember one trip in particular as Clydesdale visited Greenock Wellpark but we had a lot of call-offs on the day. The buffet was enormous, with more than enough Scotch Pies, and we were obliged to eat more than our fair share so as not to offend our hosts. I never thought I would be sick of the sight of a Scotch Pie in my life but that day was pretty close. ADVICE TO ANYONE IN THE SPORT? Respect your body, because injury is the hardest obstacle to overcome. One was a race organised by the notorious Barlinnie Prison in Glasgow to raise funds for HIV testing units within the prison. We arrived at the main gate and were ushered into our changing room which was, the warden who escorted us took great pleasure in pointing out, where the last hanging had taken place. The race itself consisted of 5 laps inside the prison. The head warden, who was a 6 foot 6inches Texan, started the race with a klaxon (no gun). A few personalities, including Terry Butcher, a couple of Celtic second-string players, a well-known Glasgow boxer and some privileged prisoners, helped to make up the 50 starters. The privileged prisoners were conspicuous by their orange plimsolls, white tops and black shorts. At the start we were surprised by a few of the orange plimsolls flying off around the first corner. Then, at the second corner they were leaning against the wall, having a fag. As the rest of us raced round we were greeted by the rattling of tin mugs against the bars of the windows – it was like a Japanese prisoner of war movie. After the race we were given a slap-up meal with the prisoners and enjoyed their company. It was an enlightening experience but I gave a sigh of relief as the big double doors slammed shut with me safely outside. Another race for the archives was in Broxburn, organised by BELL’S distillery, not so much the race itself but the finishing drinks were thimbles of whisky and the prizes consisted of bottles of the amber nectar. Can’t say if it was beneficial to after-race recovery but certainly an enjoyable warm down! By today’s drink -drive regulations we would have been very close to the limit. Similarly the Broughton Brewery race at the New Year where the first prize was a crate of the local ale, second was half a crate and 3rd was 6 of the best; and a bottle to each finisher warmed the cockles of each heart. My club was fortunate enough to finish 3rd in a prominent Glasgow road relay and the prize was 4 trouser presses. Not long afterwards, at the annual club Christmas handicap race, nicely wrapped up, were 4 very distinctive trouser presses. If any readers would like to share details of any race that they found quirky, just send the information to Colin on the back of a twenty pound note! (Brian’s friend and former Clydesdale Harrier team-mate Brian McAusland added the following. “On a two-hour plus Saturday afternoon run down through Dumbarton and the Vale of Leven and back home via The Boule – going out through Dumbarton he switched on his transistor radio (for the Thistle result later on), and there was Victor Sylvester’s music, so he grabbed me round the waist and ballroom-danced me for fifty or sixty yards up the High Street. Wasn’t even legal at the time!